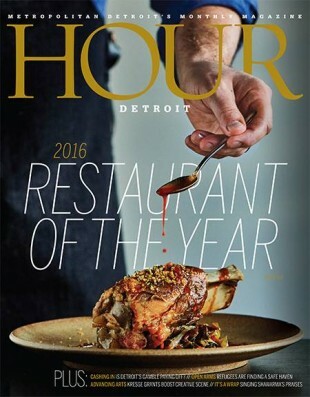 Writing that “Selden Standard has become the most notable casual high-end restaurant in the city,” Hour Detroit magazine has just named us 2016 Restaurant of the Year. It’s a tremendous honor – and the capstone to a very exciting week during which Chef Andy was also named a semi-finalist for the 2016 James Beard awards. The Hour article makes mention of our staff, referring to the “choreography” between the front of house and the kitchen. That’s really where any success we’ve had over the past year begins: It’s a talented, dedicated group of 75 individuals who enjoy their work, and we’re so thankful that they’ve chosen to be a part of this team. We’re grateful, too, for our friends and guests who have supported us and challenged us to be better. This is the second year in a row now that we’ve had the great fortune to receive an award of this kind, and we’ll keep working hard toward offering high quality food, drink, and service. Cheers! We were thrilled to see this morning that Chef Andy has been named a James Beard semi-finalist as Best Chef: Great Lakes. He joins a few other great Michigan chefs receiving accolades from the Beard Foundation: Chef Nick at Forest for the same award; Chef Garrett Lipar at Marais for Rising Star; and Mabel Gray, headed by good friend James Rigato, for Best New Restaurant. This is the second year in a row that Andy has received this honor. Swiss-based Mirus magazine visited Midtown last year, pointing their cameras at the businesses, artists, and leaders that make up the community. Selden Standard was lucky enough to be a part of their thorough examination of our neighborhood. The magazine’s staff assembled 100 pages of beautiful photography and compelling stories about many of the people and places here. If you care to visit the earlier issues, there are some pretty interesting pieces on other cities as well. Definitely worth a read. The New York Times came to town to eat and explore with Detroit-born chefs and restaurateurs Eli and Max Sussman. 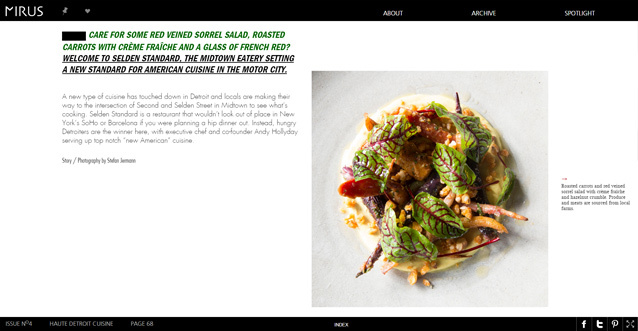 Bill Addison, restaurant editor for Eater National, came to metro Detroit and dined at a number of the newer spots in town. The Boston Globe penned a travel piece about the city, praising some restaurants, a creative culture, and the people the author met. Chef Takashi, owner of Slurping Turtle in Chicago/Ann Arbor, recently hosted a ramen battle charity benefit at his Ann Arbor location. As the Detroit News reported, Chef Andy won the battle with a chicken ramen based on chickens, hens, and eggs from Salomon Gardens, and the $2,000 prize goes to Cass Community Social Services. Andy’s recipe and an interview with Takashi are available online at the Channel 7 website. We were also fortunate enough to be included in a summary from USA Today of new businesses opening in Detroit. Finally, WDIV re-visited a story they did last year about Andy as well as our good friends Marc (Wright & Co) and Dave (Supino, La Rondinella). You can watch the video clip on the ClickOnDetroit website. Andy visited Fox 2’s studios with Rev. Faith Fowler of Cass Community Social Services to discuss their upcoming fundraiser — and to make our halloumi & melon salad. A big thanks to Sylvia Rector of the Detroit Free Press for all the kind words in her recent review of Selden Standard. 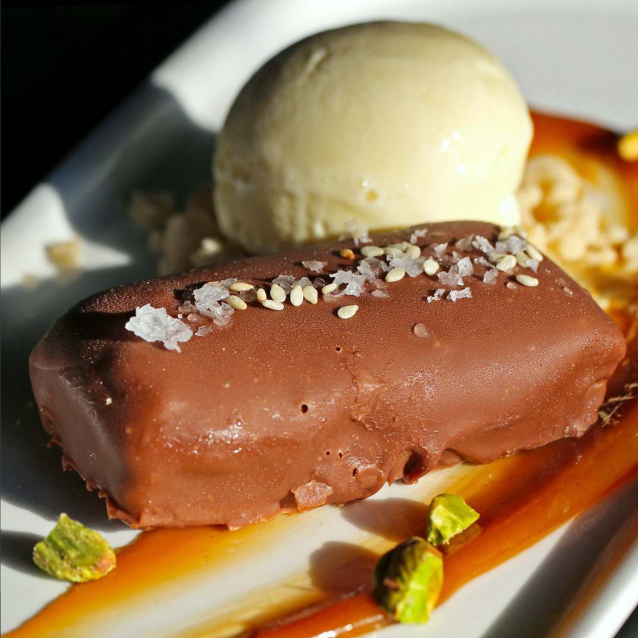 We try to lend careful thought and consideration to every item on our menu, and it’s always a pleasure when people — critics or otherwise — appreciate and enjoy what we’ve put together. Thanks to everyone for all the early support!